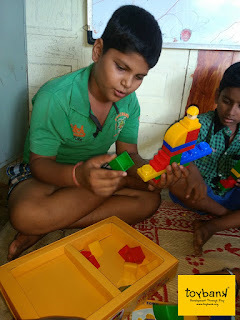 This September marked our first Toy distribution event in rural Karnataka! September 6th, 2009 - We had a fun filled Toy distribution event at Govt School in Siddarahalli, Belur, Hassan district. We reached out to 60+ kids with 9 volunteers managing the show. Toybank joined hands with 2 other social welfare groups to bring in more cheer to the children during the event. JoinUs2Help sponsered a parade drum and copywriting books for the children. Aakanksha participated and engaged the children in coloring, drawing and some craft activities. We would like to Thank each one of you who made it possible!! 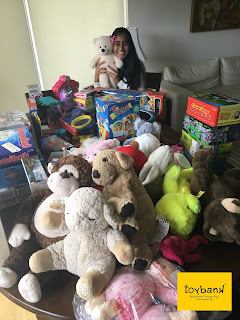 Here's how Maya, a Toybanker describes her experiences from the day! "If you asked the weatherman in Belur the weather forecast for 6th September, 209, he would have told you that there was rain in store for this temple town. He wasn’t entirely wrong…. And here is why…. Rows of children lined up according to their classes and the leader of the group (the boy who was voted as the “chief minister” of the school) gave them the ‘savadhan’ and ‘vishram’ commands. That moment seemed like the apt moment to unveil the new possession their school had received… the brand new shiny parade drum. The plastic was pulled off, the stand put in place and the stick to beat the drum was handed over to the student leader. His eyes shone with pride, while the other children eye this drum. Encouraged by the teachers, he struck the drum once… BANG… some of the children shut their ears, some looked puzzled, some a little scared. He hit it a few more times…but the faces of the children still registered looks of bewilderment. The drum had no context currently. So, the teacher asked the leader to go about his regular routine of giving commands for exercises and after a few rounds of exercise, he asked the leader to give the commands through the drum beat. Ah ha! The drum now had been placed into a context. The bewildered faces now smiled when they connected the dots and realized what the drum was for. And this drum was now theirs! But all work and no play makes jack a dull boy. And thus began the game sessions. With some explanation and some trial sessions, the games elicited many giggles and a lot of laughter. When the young ones were playing, the older ones still wanted to be part of it by being spectators. When the elders started to play, the younger ones demonstrated their vocal talents by singing as loud as they could and reciting all the nursery rhymes they knew. Games made on the spur of the moment to cater to the energy that all of them had…Phew! Then, mixed groups of children were formed and whisked away to different corners to be given a bright bunch of sketch pens and crayons to color sheets with cartoon characters on them. Kids shared the common bunch of colors they had, bargained and booked for colors and even suggested color combinations to each other. Multi-hued fishes, a mickey mouse with a blue tongue, a boy with a yellow leg and a green leg – old cartoon characters now had new avatars! And then… ta daaaa… it was time for the goodies. After all who comes to school on a Sunday if there isn’t a good enough reason eh? Notebooks, Pencils, erasers, sharpeners, pens, scales and crayons found their way to the hands of these lovely children. But, wait.. what were those mysterious bags sitting in the middle of the school ground for? Wrapped and hidden from their inquisitive eyes, they wondered what the bags contained. And then each approached the bag and picked out a mysterious package from it. When they finally got to open the package, what did they find? Toys!!! Each different from the other. Nobody had a toy just like theirs. And they each had a toy. Even the mentally challenged boy who came to their school occasionally had a bright red car. Even the cook who lovingly cooked a sumptuous meal for them every day had something to take back for her son. And it was time to wrap up the event, and guess what! volunteers were offered flowers and escorted till bus personally by kids. And, the whole school was running behind the bus waving goodbye! So, you may be wondering what the weatherman had to do with any of this. He did mention some rain… and rain there was! A rain of gifts. He forgot to mention the flood of smiles and happiness that ensued after that though. And he certainly forgot to mention the rainbow that appears after the rain. A rainbow of hope and color.. not only for the children, but also for the volunteers at the event.. of things to come.. of things to do… and things to happen!"